agent WESLEY (that's Dr. 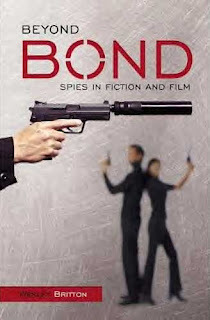 Agent) is a professor and widely published author of many books about the history and cultural context of espionage fiction in literature, film, and television, including The Encyclopedia of TV Spies, Beyond Bond: Spies in Fiction and Film, and Spy Television. Wesley also served as a media consultant to the International Spy Museum in Washington DC. More information, interviews, and resources can be found on Spywise and The Spy Report. Click images for larger view. When Jason asked me to pick my favorite spy sets from times past, I had to sit back and ponder. It wouldn’t be much fun to repeat the obvious—that Ken Adams James Bond work was the most creative and innovative in the genre. Any “Best of” list would also have to include scenes from the master of set-pieces—the very special settings in virtually every Alfred Hitchcock spy classic. If I were to include the best of the best, I’d be repeating what so many lists have already pointed out before. 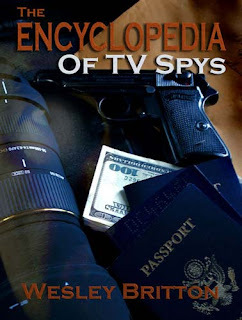 So, in honor of my new Encyclopedia of TV Spies, I thought I’d stick to television. The first four were easy—the fifth was the tough one. 1. The North Wales town of Portmeirion. 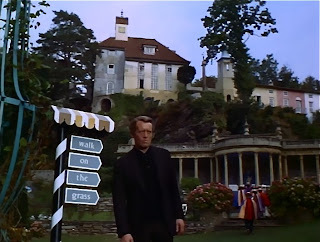 First used in 3 episodes of Danger Man, and then for all the exteriors for The Prisoner, no setting became more associated with any spy series. 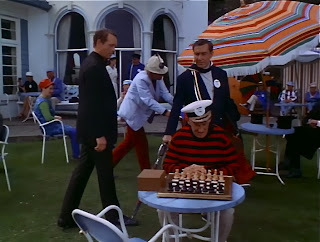 Surrounded by sea and mountains, the geography around the resort helped show Number Six was indeed trapped in the “Village.” All the unusual architectural styles of the buildings allowed for different locations to be shot in both of the classic Patrick Mcgoohan series. No other setting can be visited year after year, even hosting conventions drawing fans to the actual place where a series had been filmed. 2. The New York U.N.C.L.E. HQ. 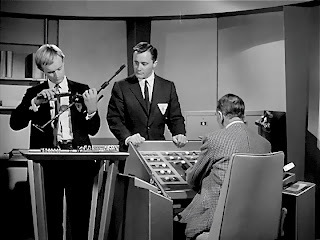 Like the Starship Enterprise, the MFU HQ was virtually a character itself throughout the series. 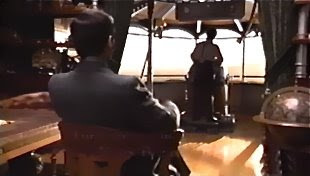 True, not one set by itself but rather a combination of many on the MGM lot, still the flavor of MFU was established in those opening shots of the brownstone exteriors, the walk through Del Floria’s tailor shop, the secret entrance in the changing booth . . . and then we were in what one character described as a “chrome metal madhouse.” Swooshing automatic doors, Mr. Waverly’s revolving table, computers lining the hallways . . . the atmosphere gave depth and style to what U.N.C.L.E. was all about. 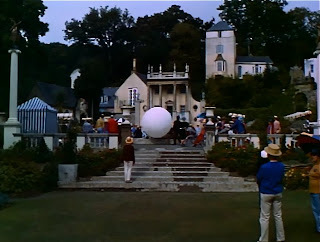 We saw it behind-the-scenes in “The Mad Mad Tea Party Affair,” “The Birds and Bees Affair” --the baddies from THRUSH were always trying nefarious ways to get inside. Somewhere out there, there are two issues of Files magazine devoted to the technical specs of this building. Deservedly so. 3. The Wanderer.” When The Wild Wild West went into production, CBS became alarmed at the expenses incurred by producer Michael Garrison. In particular, he spent $35000 for the second “Wanderer” set designed for the color seasons. 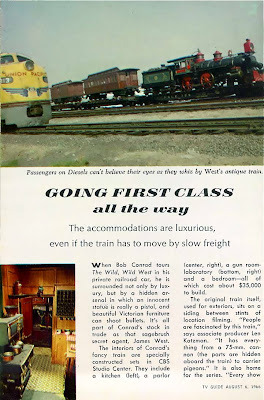 This special train consisted of a coach car with the trademark trick pool table, kitchen, laboratory, and gunroom decorated in green and gold. Guns were hidden in every nook and cranny, and a telegraph machine was hidden to receive messages from the President. A wonderful place to entertain the ladies—I’d love one myself! The Secret Adventures of Jules Verne (Sci Fi Channel) June 18—Dec. 16, 2000 Created by producer Gavin Scott in 1999, Secret Adventures was the first all-digitally produced television series ever made. 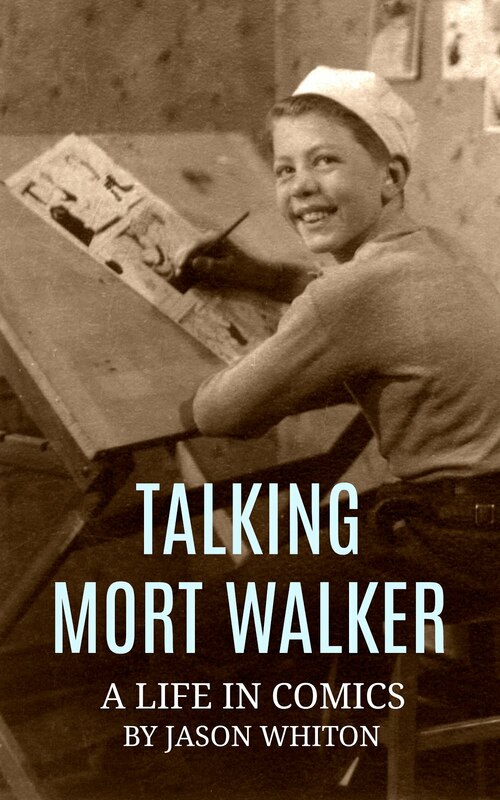 Scott’s premise was that science fiction writer Jules Verne's classic tales were not created out of whole cloth from the writer's imagination, but were instead inspired by his own wild adventures as a youth, later fictionalized as stories. 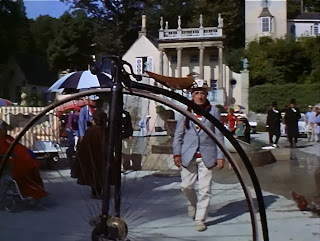 Set in the 1860s, the young Bohemian writer Jules Verne (Chris Demetral) was drawn into the war against the League of Darkness, an aristocratic organization wishing to retain power for the rich and nobly born by stirring up wars because peace promotes democracy. Verne’s compatriots included the cynical gambler Phileas Fogg (Michael Praed), the son of Sir Boniface Fogg, the deceased creator of the British Secret Service. His cousin was Rebecca Fogg (Francesca Hunt), the very Emma Peel-like leather-clad first woman secret agent for the service. Rebecca idolized her late uncle, while Phileas remained angry his father sent his brother, Eurasmus, to his death on a secret mission. 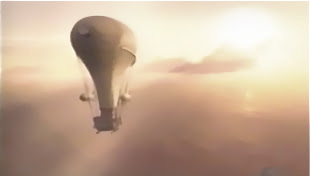 Phileas’ multi-talented manservant, Passeparcout (Michel Courtemanche), brought Verne’s scientific ideas to life in his lab on the fantastic airship, “Aurora.” Fogg won this dirigible in a Montreal card game rigged by the British government to have him involved in saving the Empire from various threats. This group’s adventures included destroying a giant mole machine designed to assassinate Queen Victoria, defeating a madman’s attempt to take over the world with rocket-powered vampires, going back in time to reunite the Three Musketeers, helping the Union army during the Civil War, assisting a young Thomas Edison who’s invented a new tank, fighting Jesse James and his gang who’ve taken over the “Aurora,” and stopping the evil Count Gregory from stealing the Holy Grail in another dimension. My item on the show is much longer than this extract, including a description of the incredible studio built to accommodate all the then cutting-edge effects in this nugget. This show was one of my favorites and it’s a crime it’s not on DVD. 5. Now the tough one. 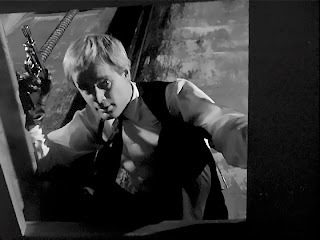 I think of the apartments of John Steed and Emma Peel—we saw them so often that we learned much about the taste and style of these two agents as they kept dropping in on each other in nearly every episode. I think of Maxwell Smart’s long hallway of opening and falling doors and the phone booth in the rear. The “cone of silence” wasn’t so much a set as a prop. How about the lab where Steve Austin was rebuilt—we saw it again and again all those years? CTU headquarters? All iconic images. So I’ll end with one I’ve never seen. Apparently, a British series, Spycatcher (BBC) Sept. 3, 1959—April 16, 1961) was based on the wartime exploits of actual counter-espionage chief Lt.-Col. Oreste Pinto (played by Bernard Archard). The set? 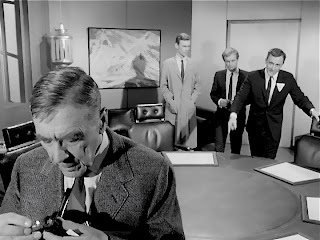 Each episode was set in only one room with one table and two chairs in which Pinto interrogated possible Nazi agents. 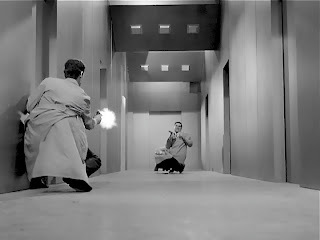 The half-hour dramas were all about the scripts, acting, and Pinto’s mental skills, including unnerving one agent by using Hitler’s face as a dartboard. Doesn’t sound like much, set-wise, but I’m intrigued by the idea of such simplicity. Week after week, one room, two people, and nothing more. It doesn’t take massive volcanoes to give us an effective stage for spy stories. 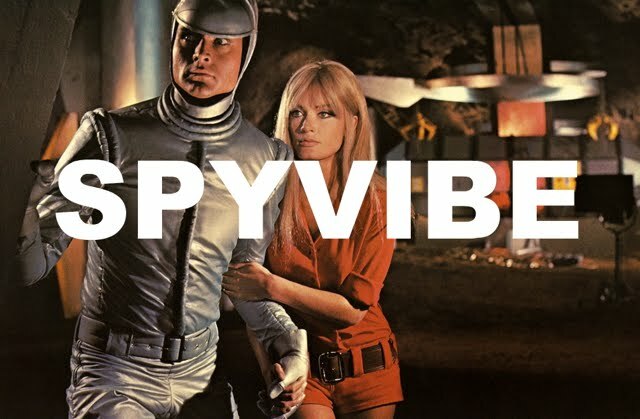 A heartfelt THANK YOU to Wesley Britton for contributing this list to Spy Vibe. I'm currently reading his fantastic "Beyond Bond." 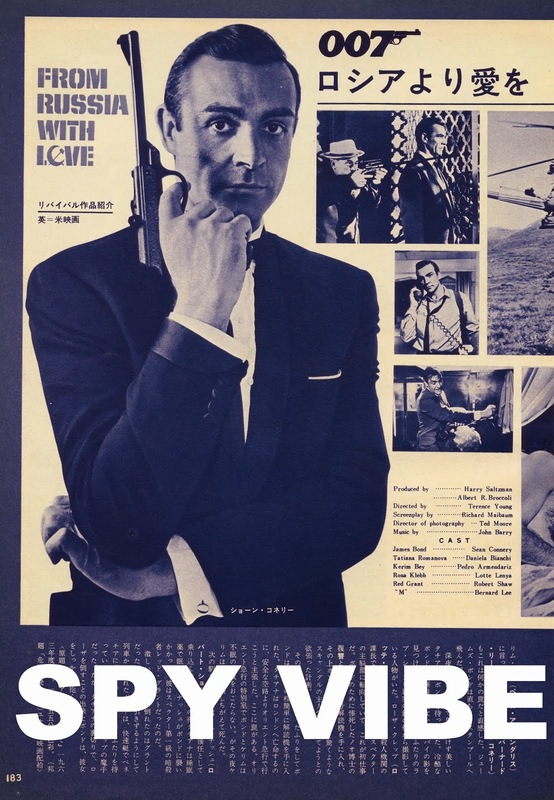 Dr. Britton does a great job covering the historical and sociological contexts of spy fiction throughout the decades- I urge you all to order it and to check out his new Encyclopedia of TV Spies. I forgot about the Wild Wild West train. That's a good pick. And I haven't even seen Jules Verne, despite my love of airships! Thanks for the recommendations, Wes!